“These extraordinary monks challenge the widespread perception that all Buddhist monks clamor for violence against the Rohingyas,” Parliament Chair Imam Malik Mujahid said presenting the awards to Burmese Buddhist leaders His Holiness Rev. Seindita, His Holiness Rev. Withudda, and His Holiness Rev. Zawtikka. Three Buddhist monks returned home to Burma last week from the Nobel Institute with World Harmony Awards, presented by the Parliament of the World’s Religions. 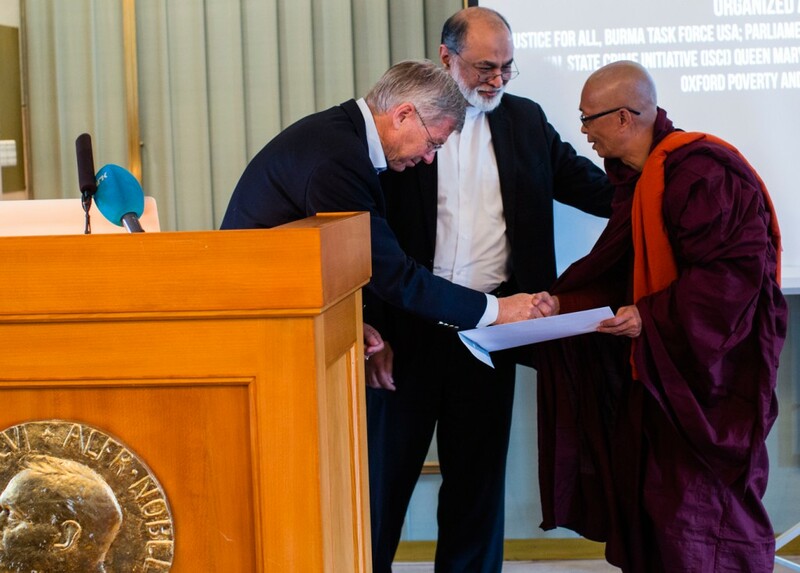 Former Prime Minister of Norway Kjell Magne Bondevik of the Christian Democratic Party joined Imam Malik Mujahid, Chair of the Parliament of the World’s Religions, in awarding the monks at the opening of the Oslo Conference to Stop the Systematic Persecution of Burma’s Rohingya. “These extraordinary monks challenge the widespread perception that all Buddhist monks clamor for violence against the Rohingyas,” Mujahid said presenting the awards to His Holiness Rev. Seindita, His Holiness Rev. Withudda, and His Holiness Rev. Zawtikka. The World Harmony Awards recognized acts of “fostering compassion, kindness, and harmony among faith communities in Myanmar,” where more than one thousand Rohingya Muslims survived violence by being protected inside of Buddhist monasteries. Rev. Seindita proclaimed, “they will have to kill me first,” before allowing aggressors to harm the Rohingya masses. In his remarks, Mujahid said that the three honorees personify the Golden Rule- describing it as both the maxim of the interfaith movement, and also the beacon of all peace and justice movements. The Parliament was a co-sponsor of the meetings held at the prestigious Norwegian Nobel Institute and Voksenaasen Conference Center in Oslo, Norway. Participants from 16 different countries, including Rohingya activists, Buddhist monks, Christian clergy, and Muslim leaders from Myanmar converged with genocide scholars to adopt a statement pressing for immediate international action. The two-day conference concluded with an additional call to action from seven Nobel Peace Laureates, describing the plight of the Rohingya as nothing less than a genocide. The Parliament plans to further highlight the bravery of interfaith activists challenging genocide in the region in a plenary focusing on war, violence and hate speech at the 2015 Parliament this October in Salt Lake City, Utah. Background information on the conference: The conference was co-organized and co-sponsored by the following organizations. However, the communiqué was adopted by the attendees of the conference without any approach to the respective organizations. The Oslo Conference statement can be accessed by visiting BurmaMuslims.org. If We Don’t Teach Peace, What Are We Teaching?